This is the fourth of my Great Blue Heron Blog Posts from a mid-October visit to Alabama’s Cheaha State Park. That’s Alabama’s highest point (2,407 feet) and the State Park at the center of the photograph. Lifts my spirits squarely back to my central Appalachian roots! 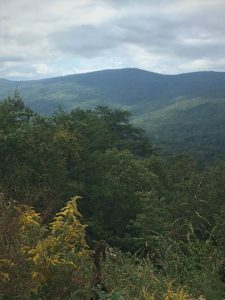 These observations are less about the Park and its Appalachian setting, and more about the special trees and plants I noticed and enjoyed while there. 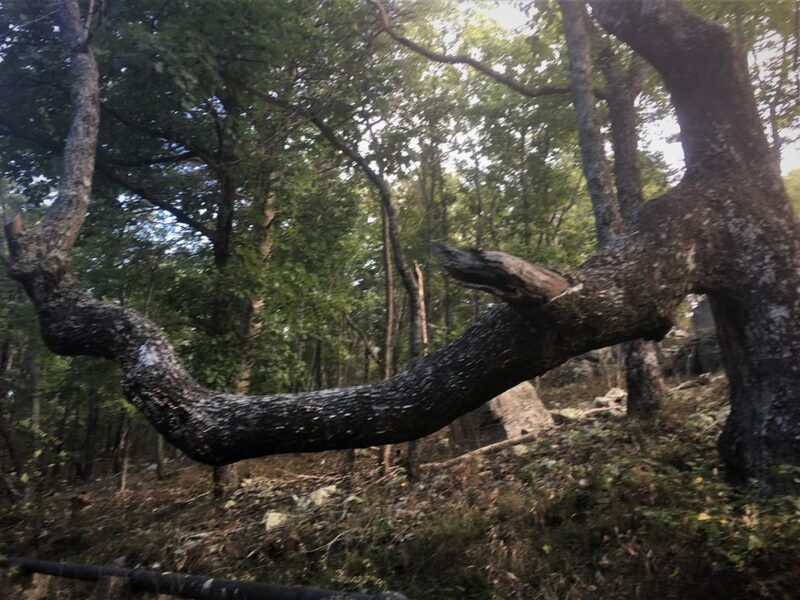 No bowtie on this Cheaha denizen, yet its massive horizontal face feature must surely reveal something about its past and its location along the road where plenty of light reaches the oak from the road clearing. I wondered how many Park visitors stopped to play games with its face? Paused to climb and then walk or perch on its sturdy limb? 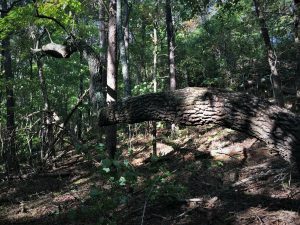 I wrote in a prior GBH Post of this likewise horizontal main stem of a sourwood (Oxydendrum arboreum) I encountered on Cheaha’s Lake Trail. I won’t repeat the reflections I previously offered on the sourwood and its adjacent chestnut oak. If you missed that Post from November 14, please take a moment, visit that Post, and learn more about my reaction and explanation. 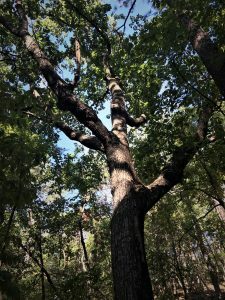 Among other things, I speculated that the sourwood, because it pays little heed to gravity, inclined toward horizontal to escape from under the sun-robbing canopy of the chestnut oak standing above it. 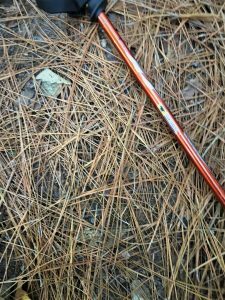 I had paused lower on the same trail to appreciate the longleaf pine (Pinus palustris) to lower left and its carpet of long-needled pine straw (lower right). 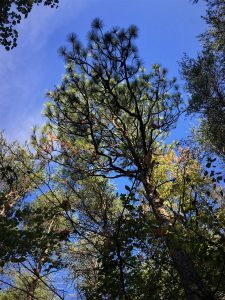 I offer no special story for that pine, other than I simply adore longleaf pine, which to me epitomizes the South… just like magnolia, live oak, pecan, and, unfortunately, kudzu! 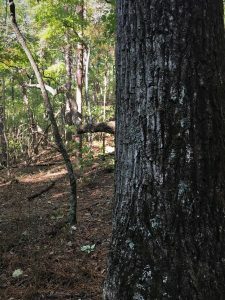 The Bald Rock ADA-accessible boardwalk trail passed above the shallow/stony hilltop soil supporting a stand of mixed hardwood and Virginia pine (Pinus virginiana). A 2014 ice storm broke many pine crowns and brought lots of the pines to the ground; a subsequent severe 2016 drought killed many surviving pines that had been top-damaged by the ice storm. Standing dead trees and downed tops now border the trail. The downed tops are richly colonized by lichens, living luxuriously on stems and twigs still bearing nutrients and providing anchorage for the lichens. All part of the process for recycling living matter back to the soil — Nature’s never ending carbon cycle. Ashes to ashes; dust to dust. Like our own lives, all things in Nature are cyclical. Midway up the Lake Trail I had to step over the white oak (Quercus alba) tree that had fallen perpendicular to the path (the downed log is in the photo lower right). 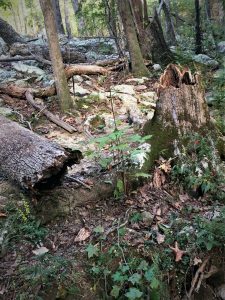 I did not puzzle long over why this long-hollowed tree had crashed to the forest floor. Instead, I wondered how it had stood as long as it had! A narrow rim of sound wood had somehow kept it alive and erect. Imagine this tree, riddled with heart rot, in an ongoing mortal combat with the internal fungal infection. Eventually, the pathogen weakened the tree beyond the equilibrium threshold, to a point where weight exceeded the weight-bearing load limit. The tree and fungus engaged in a decades-long battle. But who had won that ongoing dispute? The active fungus lost its host; the tree its life. Truth be told, there are no winners and losers… excepting the forest ecosystem that will live on untold generations of fungi and trees forward. And also like our own lives, all things in Nature strive for balance. Life is a delicate dance of ebbs and flows, forces and counter forces, joy and sorrow. 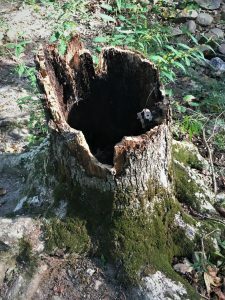 Near the hollow stump, this Virginia pine manifest its own fungal infection, a perennial target canker which, like the oak fungus, has lived with the tree for many decades. Similar to the oak heart rot/oak serious engagement, the pine and its pathogen are in some kind of physiological and physical balance. A standoff of sorts. The fungus drawing its own form of lifeblood from the tree. The tree growing at a pace sufficient to “feed” the fungus, build annual layers of wood in an attempt to compartmentalize the pathogen, and boost its own supporting super structure. Again, life is a balancing act… as is every endeavor in Nature. Think of the Himalayas as the Asian subcontinental plate slams (in this case, slam applied over deep time at geologic pace) into the Asian continent, thrusting the mountains to Everest’s greater-than-29,000-feet elevation. Yet there are equally powerful counter forces at work. The constant crushing force of massive glaciers grind the range in an effort to return the marine limestone high plateau back to the sea. No, allow me an adjustment to that statement. Neither the mountain-building nor the glacial-scouring occur with intent. The glaciers do not excerpt their force in an effort to accomplish anything. They simply do what glaciers do. They follow Nature’s laws of physics, acting on gravity’s powerful pull to Earth’s center. A mountain is nothing to a glacier. How long will it take to reduce the Himalayas to Appalachian dimensions? It doesn’t matter. Time means nothing to a glacier, nor for that matter, to a mountain. Time matters, it seems, to only us humans. I’ve examined this canker photo dozens of time. However, not until I am making these final text edits did I observe the smiling, toothless skull within the canker, somehow clenching a clay pipe! If nothing else, this discovering leads me to conclude that this will be (must be) my final edit! Not every element of Nature communicates apparent deep meaning for life and living… that is, unless I delve deeply for messages just beneath the surface. Quite simply, I like the looks of mountain laurel (Kalmia latifolia). It’s content occupying the understory — no need for full sunlight; often satisfied with shallow, stony, dry, and exposed sites. Attractive shredded bark texture; contorted (and visually pleasing) branching pattern. Beautiful spring and early summer flowers. Persistent leaves — a broad-leafed evergreen; a member of the heath family. A tough semi-tree that has appealed to my aesthetic sensibility and ecological appreciation since my undergraduate forestry days. I think of it as a signature shrub of my Central Appalachian home, yet here it is thriving and common in Alabama’s Cheaha State Park. So, allow me to admit that part of the attraction is sentimental. However, as I admired this specimen mid-October along the trail, I noticed an embedded lesson (actually two lessons — one ecological; the other for our lives and living) that had avoided me over my entire applied ecology career. 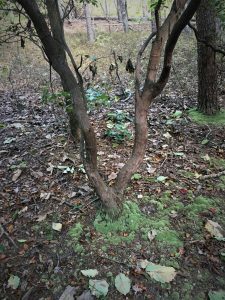 Notice the lush moss carpet surrounding both the base of the laurel and the Virginia pine beyond it (above right photo). I have long observed the common phenomenon of stem flow. Rainwater reaches the forest floor via two pathways. One is considered through-fall, passing through the crown onto the forest floor. The second pathway involves canopy interception and redirection from leaf to stem to branches and then to the trunk. The second route is termed stem flow, which in flowing transports organic debris sloughed from its journey. 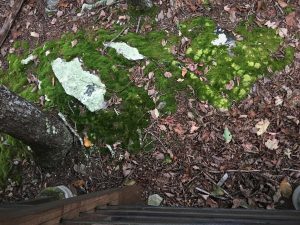 The moss is flourishing at the laurel’s base from the delivered water and nutrients. I will pay more attention the next time I am on such an impoverished site. Was this a matter of coincidence, or a pattern I will observe routinely? I will let readers know. The lesson for life I draw from this? Simply, such collaborative and synergistic relationships exist in our lives and enterprises. For example, individuals in long-term happy marriages live longer generally than those who are not. They draw sustenance from each other. We hear often in the world of business and real estate the long accepted wisdom that success distills to “location, location, location.” Such is the success of the lush moss. While I attribute that moss vibrancy to basal location, not all vibrant mosses are so located. The moss clump below is lower on the trail under a longleaf pine… on a much more fertile and moist site. The equation for success and fulfillment, whether in humans or mosses, entails many variables. The moss (lower left) seems quite happy on the impoverished plateau along the Bald Rock Boardwalk. To my surprise as I examined this photo more closely, the moss appears most vibrant at the base of the oak! Again, I will pay much more attention in the future to my developing hypothesis. Also near the boardwalk, dense lichens suggest that the shallow surface soils offer little in way of available nutrients and moisture. I suspect that the trees are gathering their necessary fertility and moisture from soil-filled crevices between rocks and not within reach of the lichens. 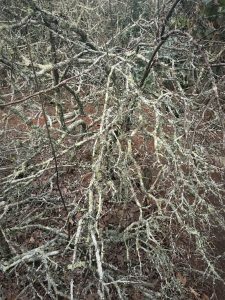 Location matters… whether to trees or lichens. Often, lichens’ needs are quite simple. They survive because they need less and are extraordinarily well-adapted to wide daily, weekly, and seasonal swings. They are adept at shutting down during periods unfavorable for active growth, and quite accomplished at reviving when things turn for the better. 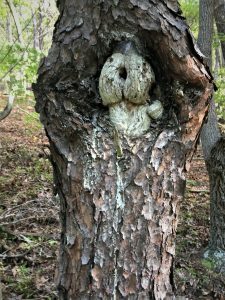 A deep drought (as in summer 2016) can kill a Virginia pine on the same site where the lichen simply turns off to weather the extended dry period. The rain, when it arrives, brings the lichen to full vibrancy. People and businesses, too, express variable tolerance for adverse conditions. Some are much more adaptive than others. The lichen below seems content on the surface of a rock. Henry David Thoreau thrived happily for a little over two years on his version of the surface of a rock at Walden pond. I’m re-reading Walden at the moment. 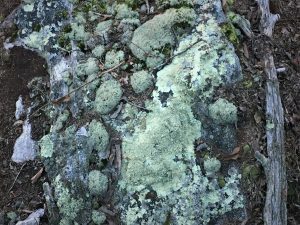 Thoreau was more lichen-like than the rest of us. He derived far more than physical sustenance from the experience — he harvested bushels of wisdom unavailable in conditions of plenty. Are we demanding richness (material, emotional, spiritual, physical) beyond the Earth’s ability to provide it long term? Are we heeding the signals? Are we alert to our species and Earth’s limitations? Are we adequately caring for our common home? The lichens will be resident whatever humanity might do to foul our common home. Will we survive our actions. It is time we awaken. 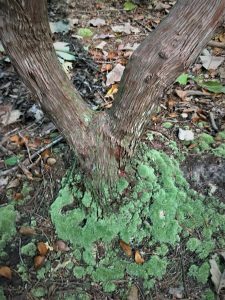 What can we learn from the lichens? 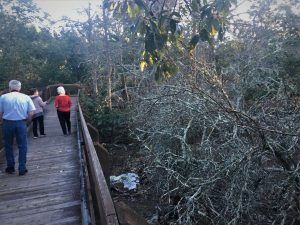 What can we learn from a walk in the woods? Don’t be blind to what lies in front of you. 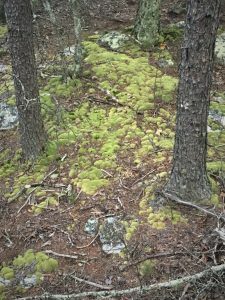 “Vision is the art of seeing what is invisible to others.” (Jonathon Swift) Even I, a lifelong student of Nature, had not noticed or appreciated the apparent link between forest floor mosses and stem flow. Our lives, as in all things natural, depend upon continuing struggles seeking balance and equilibrium. Critical thresholds determine the course of our lives and enterprises. Few things in life, enterprise, and Nature matter more than location, location, location! In part, I find my joy in communicating these stories of passion for place and everyday Nature. Are you making the most of your location?